In double table tennis does rules allow to serve in to table side (red line) or only in to green ? in doubles, the ball shall touch successively the right half court of server and receiver. There is no requirement that the ball crosses the end line of the receiving team - but note that the serve you've drawn would result in the server losing the point as it is not touching the right half court of the server and the receiver. 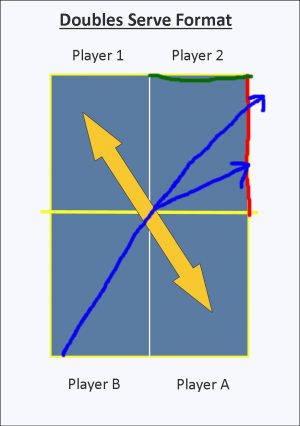 In doubles, you must always serve from the right half (Player A) of the server's side with the ball going diagonally to the right half (to Player 1) of the opposite side. The diagram shown in the question is an incorrect serve as you never serve from Player B to Player 2.